The Greenland Barnacle Goose breeds in northeastern Greenland and winters almost entirely along the west coasts of Scotland and Ireland. The main concentration is found on the isle of Islay, Scotland, which regularly supports over 50% of the population. Ringing studies have shown that Greenland Barnacle Geese are very faithful to specific wintering sites, with 70% of birds returning to the same site during the following winter. Estimates of population size of Greenland Barnacle Goose, 1959-2018; recorded during the International Census of Greenland Barnacle Geese. Annual estimates of the percenatage of young (%) and mean brood size (young per successful pair) of Greenland Barnacle Goose, 2004/05-2016/17; recorded on the isles of Islay, Scotland where data have been collected regularly. Musgrove, A.J., G.E. Austin, R.D. Hearn, C.A. Holt, D.A. Stroud & S.R. Wotton. 2011. Overwinter population estimates of British waterbirds. British Birds 104: 364-397. The Greenland population of Barnacle Goose breeds in northeastern Greenland. Migration begins in late August/early September, and birds use stop over sites in southeast Iceland. The geese begin to leave Iceland from late September and by November they have all reached the British and Irish wintering grounds. Ringing studies have shown that Greenland Barnacle Geese are very faithful to specific wintering sites, with 70% of birds returning to the same site during the following winter. The islands off the west and north coasts of Scotland and Ireland (as well as several mainland sites) support the entire population during the winter. The main concentration is on the island of Islay, with 78% of the Scottish total and 56% of the overall population occurring there in 2013 (Mitchell & Hall 2013). As numbers on Islay have steadily increased, some other key sites – notably Coll and Tiree (Inner Hebrides) and South Walls (Orkney) – have also become increasingly important, possibly as a result of an increase in intensively managed grasslands providing more favourable feeding habitat, as well as the establishment of Goose Management Schemes. Some smaller, uninhabited islands are now less used, possibly due to habitat changes possibly brought about by cessation of grazing. There have been some substantial changes in distribution since surveys began in 1957, when the population was equally divided between Islay, the rest of Scotland, and Ireland. Since then, numbers have increased on Islay which, in 2003, held 65% of the total population and 56% in 2013. Traditionally, saltmarshes, coastal pastures and islands were selected as favoured feeding areas, but more recently the requirement for short-cropped sward has been met by intensively managed grasslands. The geese feed on grasses, herbs, leaves, stolons and seeds, as well as barley and oat stubbles, spilt grain and undersown grass. Since the mid-twentieth centuray there has been an increase in the use of agricultural fields as feeding grounds. Most conflict occurs on Islay, as well as some of the other inhabited islands off the north and west coast of Scotland. To alleviate these conflicts, Goose Management Schemes are now in operation on Islay and South Walls, Orkney. Mitchell, C., A. Walsh, C. Hall & O. Crowe. 2008. 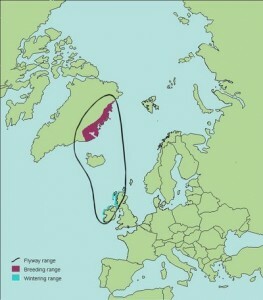 Greenland Barnacle Geese Branta leucopsis in Britain and Ireland: results of the international census, spring 2008. Wildfowl & Wetlands Trust, Slimbridge. Ogilvie, M.A., D. Boertmann, D. Cabot, O. Merne, S.M. Percival & A. Sigfusson. 1999. Barnacle Goose Branta leucopsis: Greenland. In: Madsen, J., G. Cracknell & A.D. Fox (eds.). 1999. Goose populations of the Western Palearctic. A review of status and distribution. Wetlands International Publication no. 48, Wetlands International, Wageningen, The Netherlands/National Environmental Research Institute, Ronde, Denmark. Due to many Greenland Barnacle Goose wintering sites being remote inaccessible islands, a complete census of the population is not possible every year, as aerial surveys are required to cover such areas. 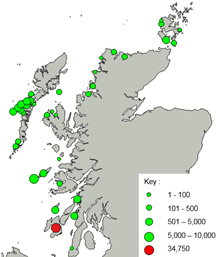 Annual counts are, however, undertaken at several key sites in Scotland. Two comprehensive counts are organised by Scottish Natural Heritage (SNH) on Islay, and monthly counts are also carried out by SNH at South Walls, Orkney. The RSPB undertake at least two counts during the winter on the Inner Herbridean isles of Coll, Tiree, Colonsay and Oronsay. Age assessments are also carried out on Islay and Tiree, where counters record the number of young present in flocks as well as individual brood sizes (i.e. the size of family groups). Results from these surveys are summarised on the ‘Latest Results’ tab. A census of the entire Greenland Barnacle Goose population is undertaken every five years. The census covers Ireland and north and west Scotland and involves both ground counts and aerial surveys, the latter covering the inaccessible areas. Results from these censuses are presented in various reports and papers. See our Reports and newsletter page. In March 2018, the most recent flyway-wide census of Greenland Barnacle Geese took place, including those parts of the winter range that need to be checked using a light aircraft. The full results from the census are presented in Mitchell & Hall (2018). The population estimate was 72,162, a 10.5% decrease on the last complete census conducted in 2013 (80,670). In Ireland, 16,237 birds were counted, a decrease of 7.2%. 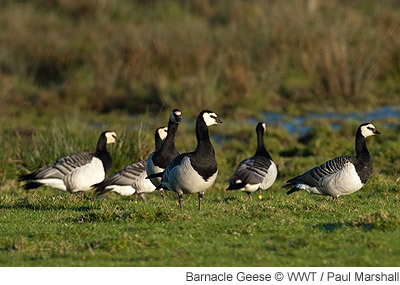 In Scotland, 229 sites were surveyed, including 190 islands by aerial census and Barnacle Geese were found at 39 sites (Figure 1). A total of 55,424 birds were counted and an estimate of 501 birds were included from one site, giving a total of 55,925 birds, a decrease of 11.5% since 2013. Islay was the most important site with 34,750 birds counted (Table 1) – 22.6% lower than the number recorded there five years previously. Compared to 2013, there were increases in numbers in areas surrounding Islay; numbers on Tiree and Coll increased by 17.8% to 6,477 and, on North Uist (mainland), numbers increased by 68.9% to 5,950. Figure 1. The distribution of Greenland Barnacle Geese in Scotland recorded during the mid-March 2018 international census. Table 1. Counts of Greenland Barnacle Geese made during the March 2018 survey of over 1% of the Scottish total. On Islay, the most important wintering site in the UK for Greenland Barnacle Geese, up to four co-ordinated counts were undertaken during winter 2017/18. 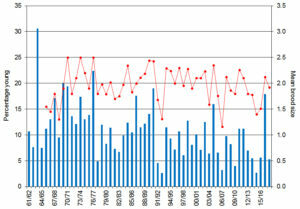 These revealed 48,366 birds in November, 43,351 in December, 37,487 in January and 34,750 in March. The mean of these four counts was 40,989 birds which represents a 12.2% decrease compared to winter 2016/17 (mean 46,714 geese, Figure 2). The November 2017 count was 5,000 birds higher than the count a month later and 13,600 higher than the March 2018 count. The November count presumably included transient geese that did not stay to winter on Islay and, in addition, 3,321 birds were shot there during the winter. Figure 2. Adopted counts (mean of the winter counts) of Greenland Barnacle Geese on Islay, 2008/09-2017/18. Breeding success is measured annually on Islay and counts in autumn 2017 revealed a poor breeding season. Just over 9,000 birds were aged and 5.3% were young, with a mean brood size of 1.92 young per successful pair (Table 2). Table 2. The percentage of young and mean brood size of Greenland Barnacle Geese during winter 2017/18. Figure 3. Percentage young (blue columns) and mean brood size (red circles) of Greenland Barnacle Goose on Islay (where data have been collected regularly), 1961/62–2017/18. The census in March 2018 indicated that the flyway population has decreased by 10.5% to 72,162 birds compared to 2013. 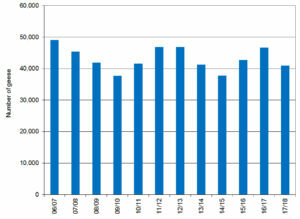 The long-term increase in numbers, from the 1950s up to 2013, seems to have been halted. Up to c.2,000 Greenland Barnacle Geese are shot in Iceland each year and licences to shoot up to #### on Islay have been issued by the Scottish Government in recent years. It may be that this level of mortality, combined with relatively low annual productivity in the last ten years is keeping population growth in check. Several key sites in Scotland hold the majority of Greenland Barnacle Geese with the majority wintering on the Inner Hebridean island on Islay (Table 1). The decrease in numbers on Islay of 22% compared to March 2013 involves birds recorded on the island at the end of winter. Ring-recovery information has shown that November counts on Islay include some transients (birds that stage on Islay during the autumn and move on to winter elsewhere within the range). Increases in the number of Greenland Barnacle Geese on Tiree and Coll, and notably on North Uist (although interestingly not in Ireland), may, in part be due to birds moving from Islay due to the disturbance caused by the culls being carried out there. Results from age assessments conducted during autumn 2017 on Islay (from where the largest sample is provided) show that the 2017 breeding season was poor; the figure of 5.3% young recorded on Islay being similar to the previous ten-year mean of 6.8% (± 1.0 SE). Mean brood size on Islay in 2017 was also slightly higher than average at 1.92 young per successful pair, compared to the previous ten-year mean of 1.88 young (± 0.1 SE). Thanks are extended to Malcolm Ogilvie, Andy Knight and John Bowler for providing age counts, and the volunteer counter network, SNH and RSPB for providing additional counts. Mitchell, C. & C. Hall. 2018. Greenland Barnacle Geese Branta leucopsis in Britain and Ireland: results of the international census, spring 2018. Wildfowl & Wetlands Trust Report, Slimbridge. Previous annual results will be archived here. Published results from previous international censuses can be found on the Reports & newsletter page. Mitchell, C., C. Hall & A. Douse. 2009. Greenland Barnacle Geese in Scotland in 2008. Scottish Birds 29: 99-100. Walsh, A.J. & O. Crowe. 2008. Barnacle Geese Branta leucopsis in Ireland, spring 2008. Irish Birds 8: 430-432. Hunting in Iceland: The numbers of Greenland Barnacle Geese hunted in Iceland are available here.